Sara Crave is a leading provider of quality fashion forward women's fitness clothes, and believes in building and contributing to a community through engagement with all the wonderful people who make the brand possible. To name just a few, first and foremost our fantastic customers, the designers, manufacturers, photographers, make-up artists, and the models (Sara’s angels) who all give life to Sara Crave. Through rallying all these unique and wonderful people around us, who share a love of fashion and women's fitness clothes, Sara Crave has a vision to provide support for others less fortunate, by engaging with worthy causes and charity movements. In this way we’ll be helping to make the world a more beautiful place, through both our stylish designs, and spreading some joy where it’s most needed. We're so happy to be a part of supporting a small group of wonderful people, who are caring for Colombian kids who need some help getting a better start in life. Come along on Saturday 24 October 2015 for an afternoon of fashion, high tea and wine, and show your support for a great cause. Enjoy watching some of Brisbane's boutique bashion brands on the runway, whilst sipping wine over high tea. There are fabulous prizes to be won. Every ticket includes a glass of Australian sparkling and helps raise funds for the “Fundacion Evolution del Pensamiento” Education Volunteer program, which is sending Aussie teachers to help educate under privileged children in Colombia, South America. It’s time to put your name down for one of the most fun events of the year that supports a good cause. A Walk in the Park is aimed at celebrating and supporting people with Parkinson’s and other movement disorders. Over 17,000 people in Queensland have been diagnosed with Parkinsons, but it also affects carers, spouses, family and friends, as well as health care providers. Parkinson’s Queensland is the peak not-for-profit organisation that provides support, education and research for the Parkinson’s community. A Walk in the Park raises awareness and funds to help Parkinson’s Queensland deliver support programs and services to people with Parkinson’s. A Walk in the Park is not about your fitness level or ability – it’s about the importance of staying active and supporting people living with Parkinson’s in Queensland. What better way to Get Moving than by spending a fun day in New Farm Park, with a stroll along the beautiful Brisbane River. There will be live music, fun activities for the kids, along with food stall and sponsor marquees. It’s a great way to catch up with family and friends and even meet some new people. So get your most stylish fitness clothes on, get active, and enjoy the day. Sara Crave supports Teen Challenge, to raise much needed funds which go towards providing temporary crisis accommodation for young women. Sara Crave is delighted to be able to contribute towards the success of the Teen Challenge events, in support of the important work which Teen Challenge caries out throughout the community. For forty-two years Teen Challenge Qld has provided support services to young men and women aged sixteen to twenty-nine years. Our services focus on recovery from alcohol and drug dependency and associated life controlling issues such as homelessness, mental illness, criminal delinquency, eating disorders, self-harm and abuse. Services include crisis accommodation, residential rehabilitation, family support, and drug and alcohol information seminars conducted in schools and organisations throughout southeast Queensland. 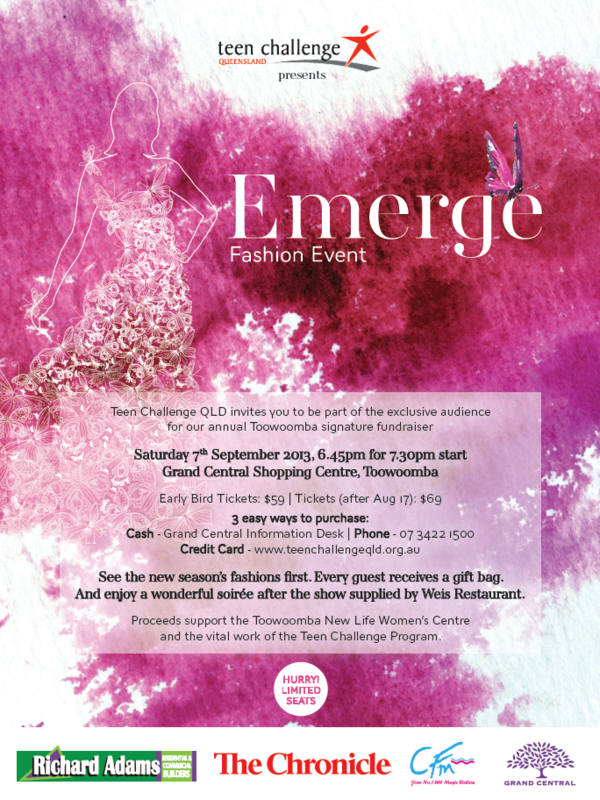 The Emerge Fashion Event is the annual signature Toowoomba fundraising event to support the New Life Women's Centre in Toowoomba. Hosted by Teen Challenge Qld, this event will once again be held at Toowoomba's premier shopping complex, Grand Central Shopping Centre. On the evening of Saturday September 7 the catwalk will come alive with seasoned professional models. See the latest in seasonal fashion combined with the unique European parade stylising of highly regarded Designer and Fashion Expert, Carolyn Taylor Smith. There's a complimentary gift bag for every guest, a live auction with some great get-away packages up for grabs, a silent auction with some prize pickings and every guest is invited to our Soirée with delicious refreshments after the show (included in the price). The New Life Women’s Centre focuses on young women recovering from drug and alcohol addiction, eating disorders, depression, issues of suicide, self-harm, homelessness, and many other life controlling issues. Unfortunately there are not enough beds for young women in Queensland who require residential help, so our facility in Toowoomba is in great demand. By purchasing an event ticket you will be helping to provide an opportunity for us to raise much needed funds to continue the vital work that we do. Secure your seat today and help give young women a second chance at life. Tickets can be purchased online at www.teenchallengeqld.org.au, from the Grand Central Information Desk (cash only) or by phoning Teen Challenge (07)3422 1500.